transformed into a new set of chemicals. Hydrogen and oxygen combine to form water. But the equation is not balanced. 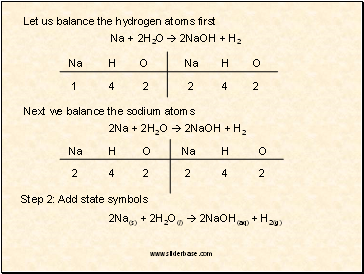 There are 2 oxygen atoms on the reactant side of the equation, but only one on the product side. 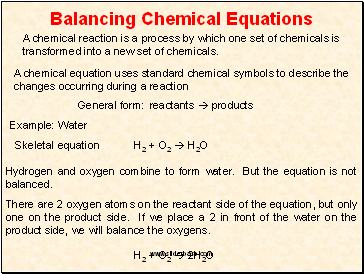 If we place a 2 in front of the water on the product side, we will balance the oxygens. 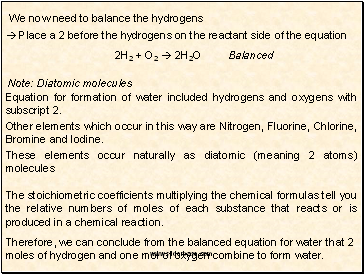 Equation for formation of water included hydrogens and oxygens with subscript 2. Other elements which occur in this way are Nitrogen, Fluorine, Chlorine, Bromine and Iodine. The stoichiometric coefficients multiplying the chemical formulas tell you the relative numbers of moles of each substance that reacts or is produced in a chemical reaction. Therefore, we can conclude from the balanced equation for water that 2 moles of hydrogen and one mol of oxygen combine to form water. 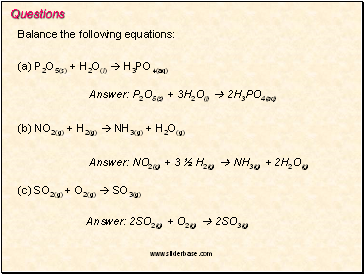 These are found as subscripts after each reactant and product. 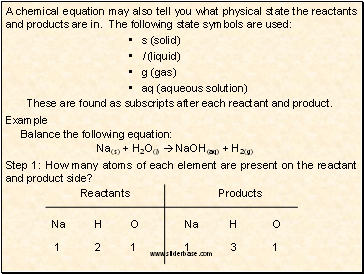 Step 1: How many atoms of each element are present on the reactant and product side?